each week by clicking here. 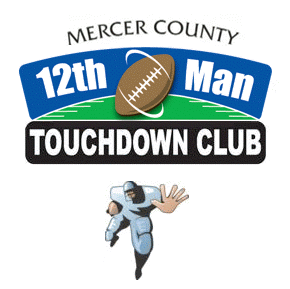 Each week in the fall, the Delaware Valley Chapter's 12th Man Touchdown Club honors Mercer County's offensive, defensive, and special team players of the week with a dinner at Massimo's Restaurant, 1035 Washington Blvd. in Robbinsville. Mr. Steve Tuckerson serves weekly as Master of Ceremonies. Dinner begins at 7:00 P.M. with pictures of the student-athletes. This year's schedule is listed at the bottom of the page. THANKSGIVING DAY GAME HONOREES . 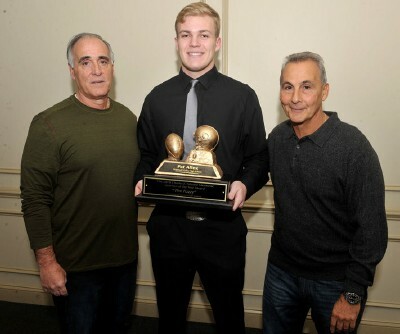 . .
Lineman of the Year Pat Allex is joined by Mike Calisti [left] and George Rago [right] who were teammates of Charles Falzone for which the trophy is named. : Join us in September as we kick off the 2019 season! 2018 SCHEDULE . . .
Captains invited from all schools. Area football officials are invited to attend. Organizers of the Sunshine Football Classic will present game proceeds to the Sunshine Foundation. Players of the Week from Week 3 and Week 4 are recognized. School administrators and all program support staff (athletic trainers, assistant coaches, statisticians, team managers, etc.) are invited to attend. Players of the Week from Week 5 and Week 6 are recognized. Representatives from area youth football organizations, school booster clubs and cheerleaders/coaches are invited to attend. Unsung Heroes are invited from all chapter schools for recognition. 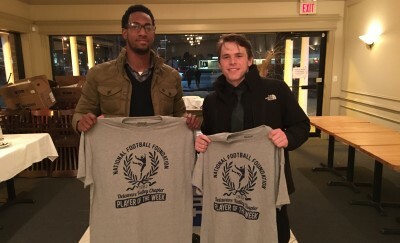 Players of the Week from Week 9 and Week 10 are recognized. 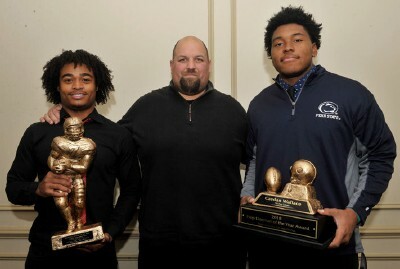 Players of the Year and Linemen of the Year Awards will be presented. 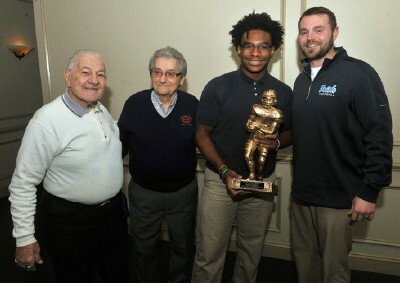 Players of the Week from remaining NJSIAA and Thanksgiving games are recognized.